I have found as I travel that some people are more open to the gospel than others. I never know how it is going to play out, so I just give out the Word of God and invite people to come to Christ. And people will react in different ways. The apostle Paul received three reactions to the gospel when he preached it: “And when they heard of the resurrection of the dead, some mocked, while others said, ‘We will hear you again on this matter. . . .’ However, some men joined him and believed” (Acts 17:32, 34). We find the same reactions to the gospel today. Some will mock. The term “mocked” used in Acts 17 also could be translated “sneered” or “burst out laughing.” In other words, Are you serious? You actually believe that? To these educated fools, it all seemed silly and unbelievable. But this very mockery was an indication they were going to perish because “the preaching of the gospel is to them that are perishing foolishness” (1 Corinthians 1:18). Some will mock, while others will delay. We will hear you again on this matter. This is a very common reaction. What it actually means is, “I really don’t want to decide right now.” The devil uses this tactic to great effect. Don’t worry about it now. Deal with it later. But some believed. Some repented and changed their minds, and among them was Dionysius the Areopagite, one of the judges who was an intellectual and ruler of the city. Here is what I have come to realize. Conversion is God’s job, not mine. It is the work of the Holy Spirit in the life of an unbeliever. God holds us responsible for proclaiming the truth. But the rest is up to Him. Copyright © 2012 by Harvest Ministries. All rights reserved. “Do you value the teaching and encouragement you receive from A New Beginning with Greg Laurie? 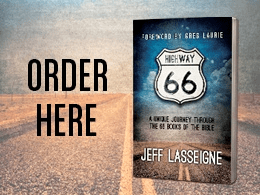 In this one-of-a-kind book, Pastor Jeff Lasseigne has compiled important information, fascinating facts, notable notes and quotable quotes for each and every book of the Bible. Hop in and buckle up for an adventure . . . along Highway 66! Highway 66 will be sent to you in thanks for your gift of support to Harvest Ministries this month.